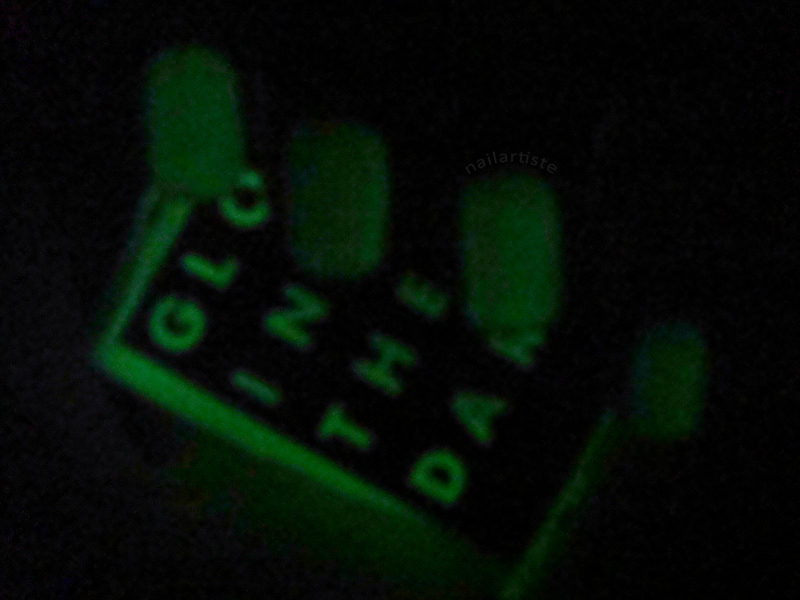 Who says glow-in-the-dark polish is just for Halloween? 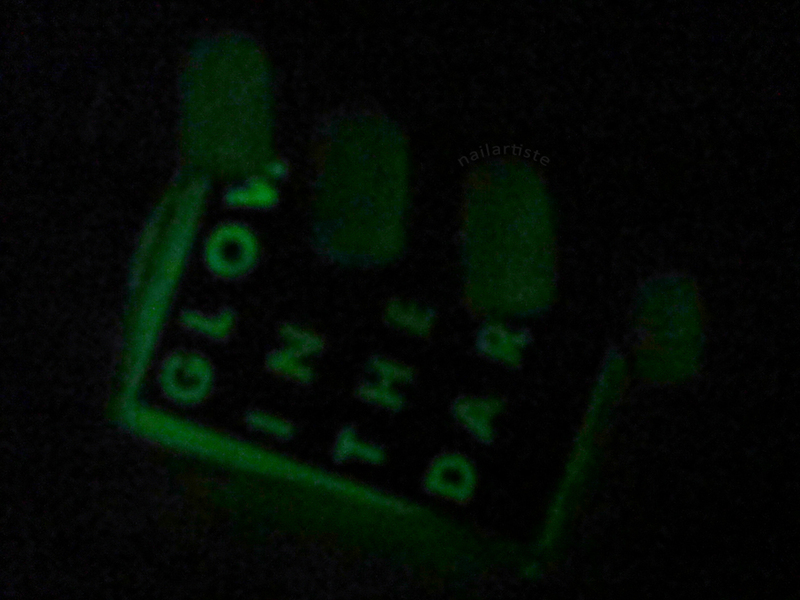 I had fun this week trying it out with American Apparel's glow-in-the-dark colour, Moon. 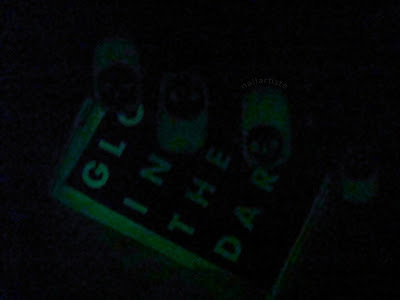 This goes on sheer and glows the traditional fluorescent green. I used two coats over two coats of OPI My Boyfriend Scales Walls. I haven't tried layering with other colours, but I'm fairly certain the base needs to be light for the glow to show. I originally had one coat of Moon, but I found two gave it extra glowing power. 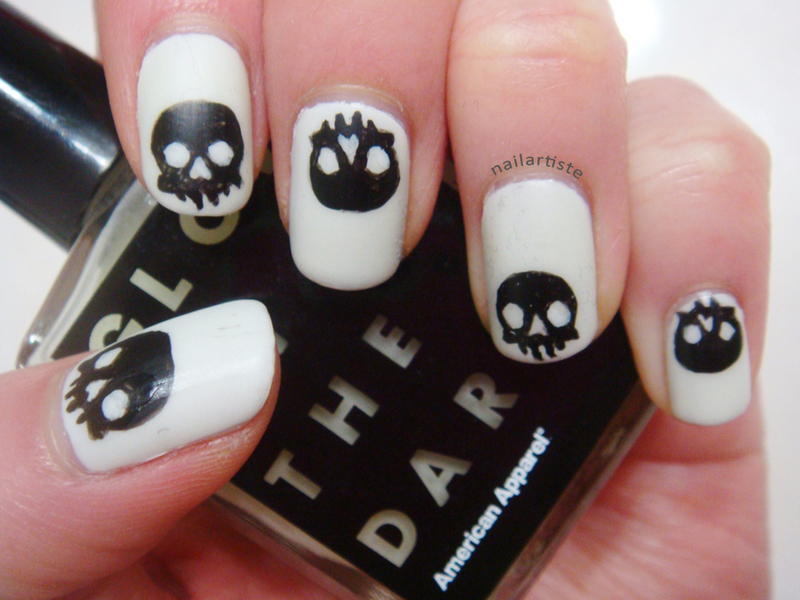 I had some fun and painted little skulls on each nail. Looking back, they kinda look like some kind of skull jellyfish. Moon gives a semi-matte finish, and I really liked how it looked. After I painted on the skulls, I put a coat of Gosh matte topcoat over to mattify everything. On my other hand, I had a different type of glow going on. One of the NEON variety! 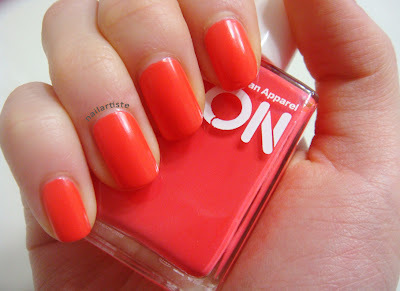 This is two coats of American Apparel's Neon Red. My camera had a hard time getting the colour right. The second picture is more colour accurate, though it makes my hands look really red. I really loved the colour. 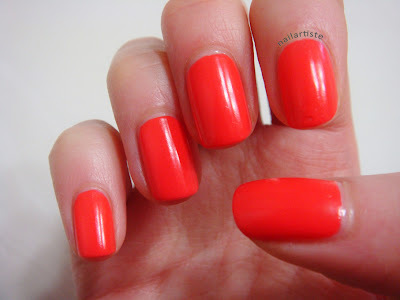 Bright, but not eye-searingly so, and a very pretty shade. The consistency is a jelly/creme hybrid, and also dries to a semi-matte finish. I've been doing really simple stuff lately as I'm going through exams. Please stick with me, I hope to get back into the groove of things soon! See ya! Hello hello, my lovelies. I am preparing for a week of cramstudy for an exam I have this coming Saturday, so I am making my weekly post early. I have quite a romantic set of nails for V-day this week. Or, you know, creepy, if you think having an eye staring back at you from your nail is creepy. Whatevs. I wouldn't exactly say that I'm a romantic, so I had a bit of a time coming up with Valentine's mani ideas. I didn't want to go with the traditional red, pink, white colour scheme, and I also wanted to do something more than just lovey dovey hearts. I think this literal take on the expression "apple of my eye" is a good compromise. Still has a lovey dovey heart, but also just enough creepy hahaha. I started off with two coats of American Apparel L'Esprit. It's basically a one coater, but I used two to make it perfect. It's a super pretty lavender colour that actually doesn't make my skin look washed out. After outlining my eye shape, I filled it in with OPI My Boyfriend Scales Walls. Notice that my lines do not start out clean by any means. I use the white to refine a little bit. I used China Glaze Flyin' High for the pupil, and Purr-fect Plum for the apple. When it's this close-up, you can really see all the lumps and bumps, but top coat fixes all. The rest of my fingers kind of just happened. I painted the XO's on my ring finger with My Boyfriend Scales Walls. Then I used American Apparel Coney Island for the pink heart on my thumb, and outlined it with Purr-fect Plum. Now what to do for my pinky? I already had an "eye" and a "heart"...OH! "Eye heart U!" "I'm so clever," I think, as I pat myself on the back. The glitter that you see on my index is Revlon Whimsical. It all ties together! 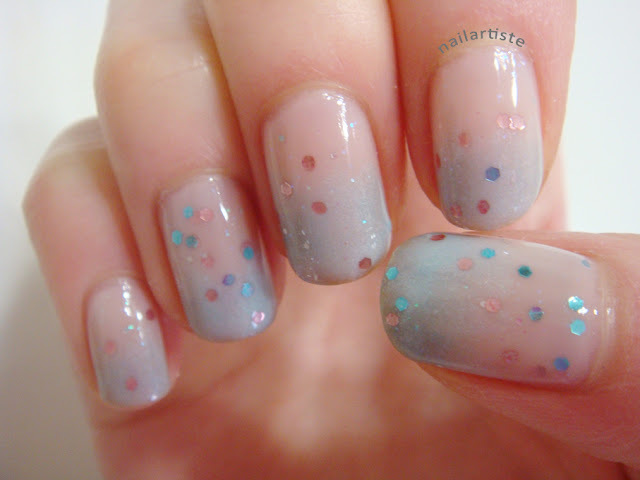 I love this jelly gradient look! I started with two coats of OPI "You Callin' Me A Lyre". Then I lightly brushed Sally Hansen Dive Deeper, a sheer, icy, "Cinderella blue" onto the tips. I topped everything with a layer of Whimsical. 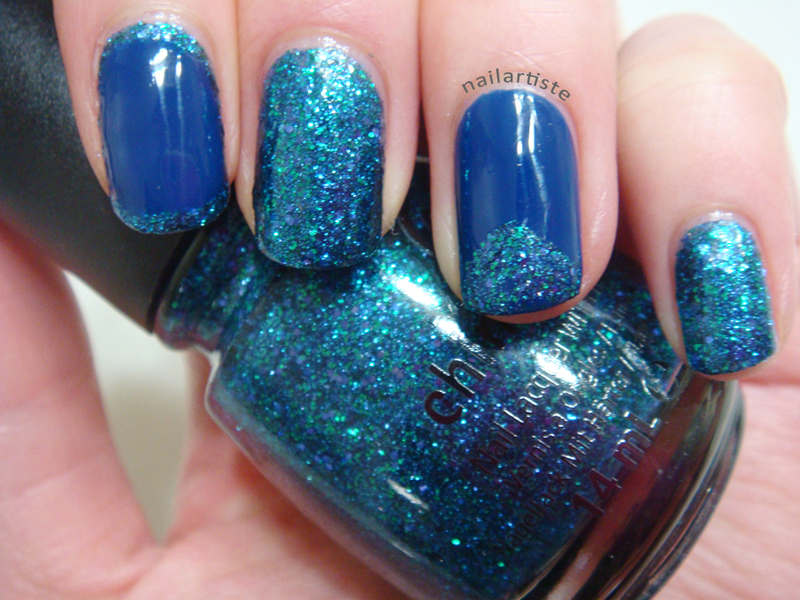 The lightly tinted, milky blue base of Whimsical, along with the glitter, helped to blend everything together. Since this is my first (mini) photo tutorial, I'd love to know what you guys think! Do you prefer real nail pictures, or my previous hand-drawn tutorials? Have a great week! Water, water, water...blue, blue, blue! I couldn't come up with a title describing the nails, so I opted for a chant that they had us do during frosh week at the University of Waterloo, except change "blue" to "loo". ANYWAYS, it's appropriate because today I have China Glaze Water You Waiting For - a beautiful mix of blue and green glitters in a blue tinted base - and China Glaze Manhunt. They're both such gorgeous blues, and WYWF gives me the bling that I so crave. I painted two coats of Water You Waiting For on all my nails except my ring finger, where I painted two coats of Manhunt. Then I took a small brush to make triangle shapes on the tips of my thumb and ring finger in the opposing colours. On my index, I used the bottle brush from Manhunt to fill in the middle my nail, leaving a border of WYWF exposed. I quite like this border look with glitter, as it's not as stark, and much more forgiving than traditional border nails. Simple stuff today! See you next week! I am in love. Yes, it's true. Let me shout it from the rooftops! 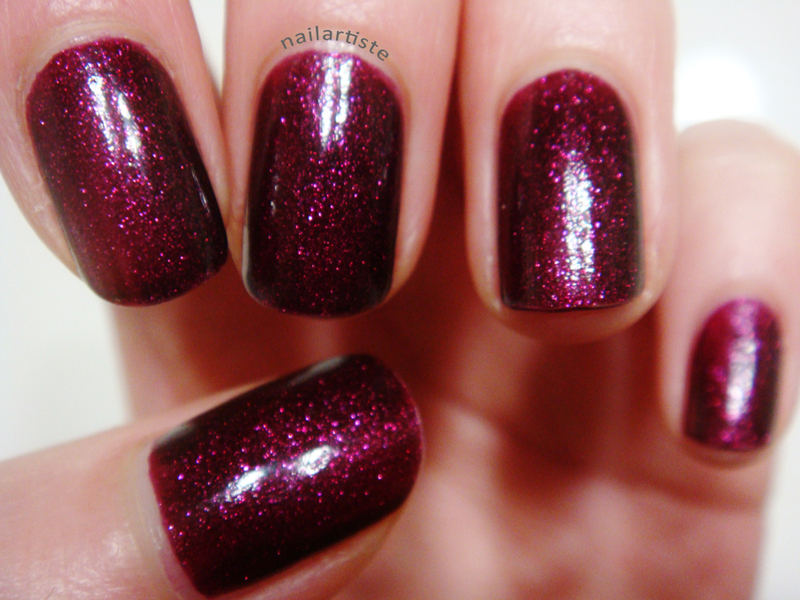 I AM IN LOVE WITH PLUM!! And this was the polish to do it - Deborah Lippmann's Good Girl Gone Bad. It was a slow start at first - I have a couple, but was never much of a "purple" wearer. Then, on that fateful Boxing Day of Dec. 26, 2012, there it was. 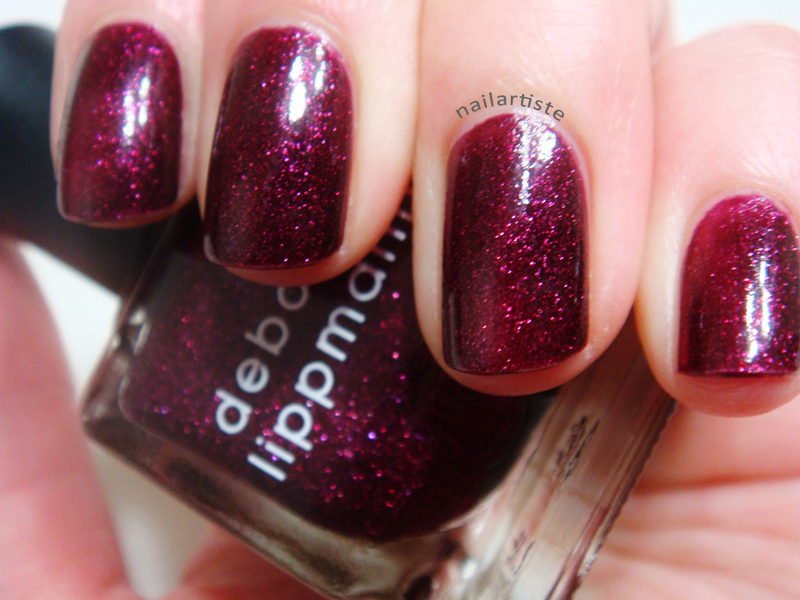 Several Deborah Lippmann polishes on sale for $5. Who can says no to that? I brought home a couple and they've been sitting with the rest of my untried's...until last week. I had just trimmed my nails and was in the mood for a dark colour for my shorties. Seeing as I hadn't tried GGGB yet, I thought why not. Bam. That's it, I was done. After the second smooth coat, all I could do was thank the fates for bringing me and this beauty together. Now was that not a better love story than Twilight? The dark plum base is loaded with tiny pink and purple shimmer that seriously GLOWS. It has that "dark around the edges" look that just gives it that much more depth. I wore it for a week straight (with minimal tip wear too! ), and by the end, I was not even a little bored of the colour. Haven't felt this intense a love for a polish in a while. It's translated into my general wardrobe as well. Blazers, tops, dresses - it's just such a great colour! 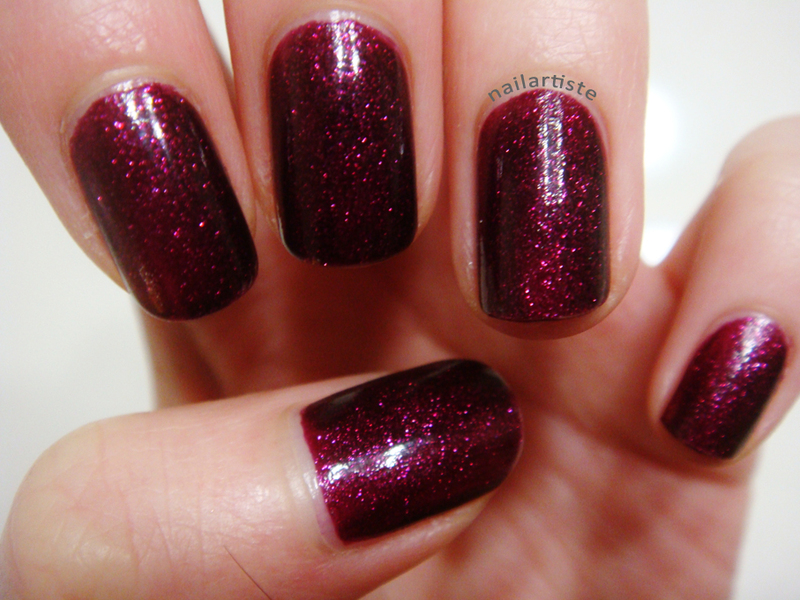 Here's another plum colour I've been wearing. 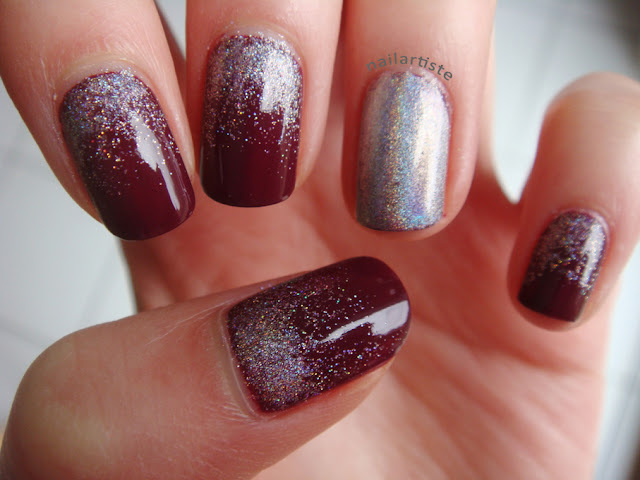 China Glaze Purr-fect Plum with China Glaze Glistening Snow gradient, and an Urban Outfitters Silver Holo accent. I think this love is gonna last! What colours have you fallen head over heels in love with? Hi, this is Vicky and this is my blog dedicated to my two great loves: art and nail polish. 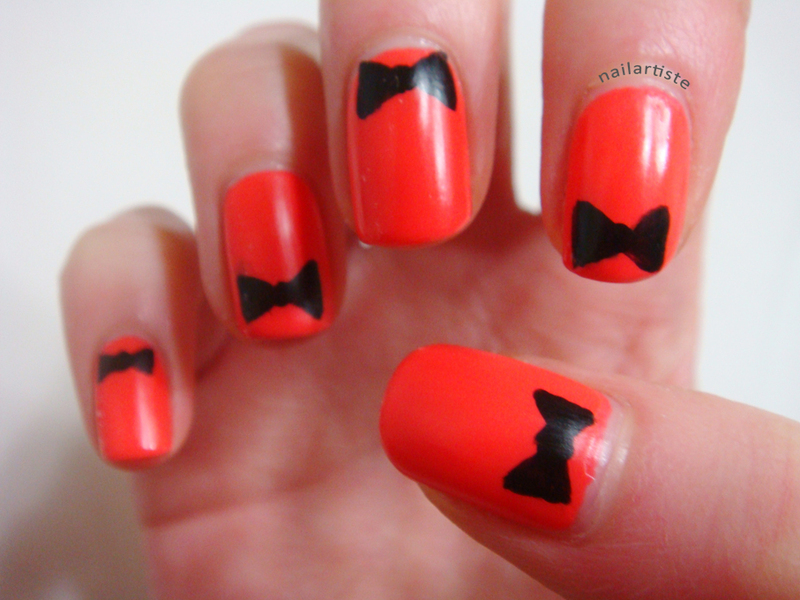 Here you'll find in-depth and easy to follow instructions for all kinds of nail art designs. Have fun and thanks for stopping by!